Hannah, my middle daughter, is quite the musician. I say that not just as a proud father, which of course I am, but also because she’s found an outlet, something to channel her emotions into. I didn’t have that at her age and there’s part of me that, today, realizes what an amazing thing it would have been to have that. 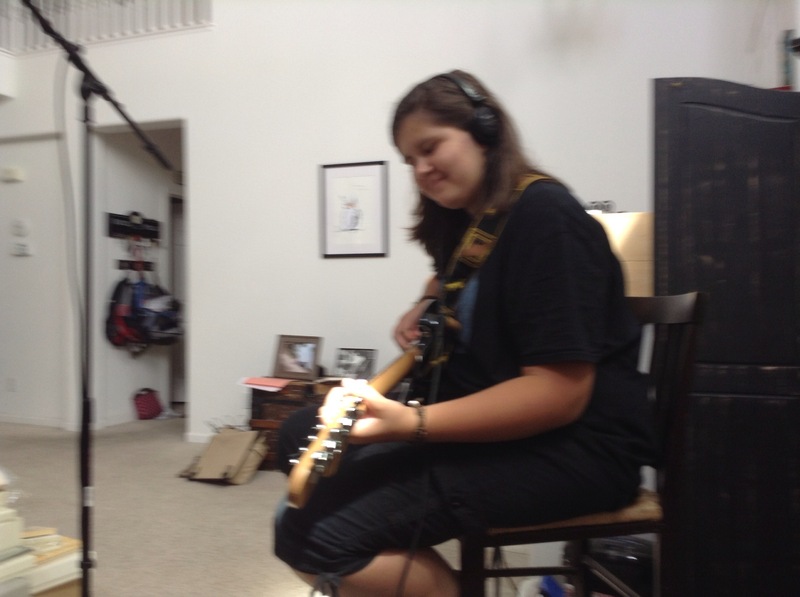 When I was about five years older than she is now I bought my first guitar, a used 1985 Fender Stratocaster. It was made in Japan, had a cruddy bridge, didn’t stay in tune very well, and I had no amplifier. Just the guitar. I loved it, by the way. It was tobacco sunburst, looked just like the guitar on the back of Clapton’s “Layla,” which was my favorite record. It took me until the age of 19 or 20 to be able to play with enough authority to channel those emotions into the guitar I slung around my shoulder. Today, the guitar is like my left arm. Others may scoff or ridicule but I don’t care. When things go wrong, right, indifferent, I play it. When my wife passed away the only thing that brought me even the tiniest bit of solace, in the numb, foggy expanse of grieving was my green Fender Stratocaster. I didn’t plug it in. I didn’t even play in front of others. At 2 and 3 in the morning I stood on the floor of my living room and beat on it. Unceremoniously. I treated it like absolute hell and it reacted as always, in tender response, in-tune and able to withstand my beatings. Hannah isn’t a lead guitar player, she’s one of those singer-songwriters. At fourteen she’s already writing her own material, something I didn’t do until I was in my twenties. Then on Sunday, her sister Abbi’s birthday, her brother mistakenly said that Hannah had written a song for her birthday. Abbi was nonplussed when Hannah told her it wasn’t for her birthday. Then she asked to borrow my Dobro, an acoustic guitar with an aluminum cone instead of a sound hole, and recorded it and sent it to Abbi. I was informed some minutes later that Abbi was crying. So was Abbi’s roommate. Hannah, you see, had taken a leap that even I couldn’t do very easily when I first started writing. She took everything that had been bothering her over that last couple years and put it into a song. In a staccato rhythm and muffled vocals on her iPhone she sang in metaphoric terms about how someone left but she left them, too. She talked about how she wanted them to know she needed them but didn’t want to need them. She sang, voice cracking, about how she looked up one day and realized that she watched you leave but she left herself. She wrote a song about what it was like to live without her mother. More than that, she wrote what it was like to know that she’d learned to live without her mother, learned to survive without her, and learned to face what was coming with what she had available to her. That sparked all the tears. My daughter’s realization, one we all had to come to eventually, vocalized and in verse. It’s been a hard two years . . . but it’s been an amazing time too. Seeing her embrace this outlet and become an amazing songwriter . . . that’s worth the tears.